As happy as I usually am, the last almost-year in Autumn Vale and at Wynter Castle has been overwhelming. I arrived here on Labor Day weekend, and since then has been a roller coaster ride of getting to know the (often) weird and (sometimes) wonderful locals. And then there have been the murders. Sigh. What to say about the murders? I didn't commit any of them, to start with. And never in my life have I been involved in a crime. No, it seems like there is some kind of alchemy involved among myself, Wynter Castle, and the crime spree right in my own (literal) backyard. So I don't feel like there has been any down time, you know? I always feel like I'm juggling and right now, with my home, aka my castle, full of feuding friends and foes, I need something (other than shopping, my worst vice) to take my mind off it all. 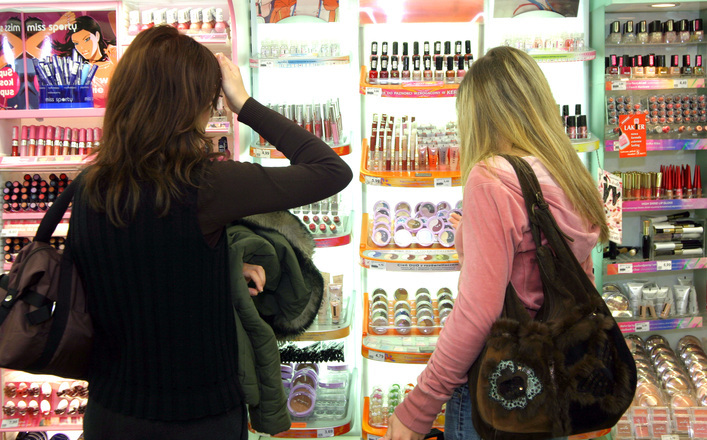 Have you ever taken up a hobby when the tension got too much, and you were afraid you might strangle someone if you didn't find a way to relax? I really don't want to strangle anyone, even if Cleta Sanson really deserves it at times. So... what would you do to take your mind off murder? Step 2 - Leave an email address where we can reach you... conceal it from the 'bots by using the form myname (at) myserver dot com if you like! Step 3 - Hope for the best and watch your email box!! I love both these series. Thanks for the chance to win. I love these books but have not read any of these as yet. Thanks for the chance and am hoping for the best. Hobby? Sort of. I recently started competitive ballroom dancing, mostly for the peronsal challenge. After a full work day I can go to the studio and focus on my goals for awhile. Dancing is detail, detail, detail mixed in the a bit of frustration but I love the challenge. Thanks for this opportunity, I am familiar with these books and would love to read them. mlarkin at reitmr dot com. I love this series. I haven't started the Amanda Cooper series yet, the first one is in my TBR pile. The one hobby I would like to start is learning to paint in water colors. I love to read, and bake, collect vintage cookbooks. I guess those are my hobbies now. What a great prize.... I would take a walk with a dog to clear my head. I am always looking for a new series & I definitely need to try this one. First I'd make sure the body was well hidden. Then I'd see about visiting some relatives at least 5 states away. I'd make sure everyone knew that I'd be taking this trip well before the 'incident' occurred. The Legion of Horrible Ladies - oh, that sounds so intriguing! I need to catch up on both series. I adore this series ! My hobbies are reading , reading and more reading :) thanks for the great giveaway ! New author for me kamundsen44ATyahooDOTcom. I head for the golf course when I want to forget everything. Thanks for the contest. When I want to get away I hide out for a while with old classic TV on and another book. Great series. Thanks for the giveaway. Your books are so much fun! Thank you for so much reading enjoyment in these two great series. I like to cook and garden. Both are relaxing. I haven't read either of these but I would love to! 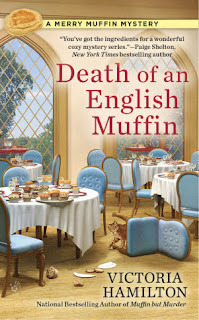 Merry Wynter is a new author for me ... the book sounds wonderful and I'm looking forward to reading it. That story sounds good. I like the giveaway, too. 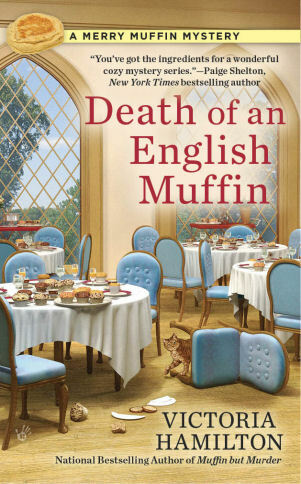 I really liked Death of an English Muffin! I want to read the teapot series also. Thanks for the chance to win! Love both book covers. Both look like great cozy mystery. Love this! Thank you for the giveaway and the reviews! I do love the idea of trying to deal with a castle, especially in the USA. Both books sound like must reads! Reading is my favorite escape but a nice walk helps me clear my mind when I need to sort things out. Merry, I take my mind off murder by playing or hiking with my dogs. It is very relaxing. No murder on the mind tonight though, my hubby and I are celebrating our 16th wedding anniversary. Thanks! meaganab(at)yahoo(dot)com. Awesome giveaway! 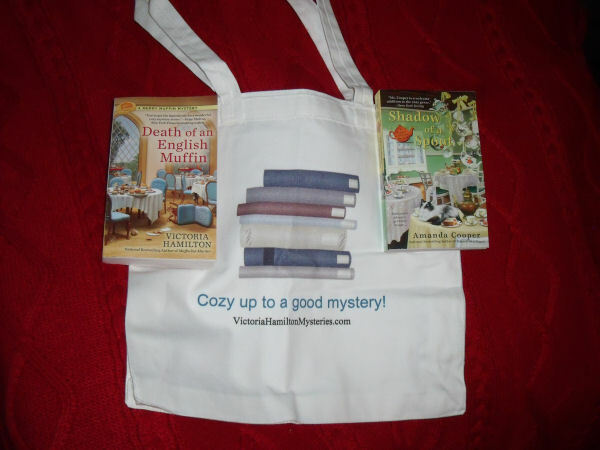 Would love to win these cozies! Thanks for the chance! I always love a good mystery. Please enter me. This giveaway is so cool. Yes, yes, and yes It is a wonderful giveaway and I've got my fingers crossed that I'm lucky enough to win. Walking is a great de-stresser for me. Nice post! I have enjoyed visiting Wyntet Castle. Thanks for the chance to win! Those books just happen to be on my TBR list. What a cute tote to top it off. Thanks for the chance to win. What a wonderful giveaway. Thanks for the chance to win. Wonderful giveaway! I do use my book tote for carrying other things since many of books are digital. But buy a large number of cozies in print! Thank you for the chance to win. Hello all... thank you all so very much for entering! I have emailed the winner. If you didn't win, please watch this space the 21st of every month because I often (And I do mean OFTEN!) use my day for giveaways. Next up in November is the 5th Vintage Kitchen Mystery, White Colander Crime! But first... see you September 21st!! I just MAY be giving stuff away again! What fun! Thank you for the chance to win!! I am looking forward to reading more of this series. On my TBR list.